After over 15 years in the design industry, Kate established her surface design studio in order to create work that truly speaks to her. From childhood, she has always had a love of pattern: the wallpaper lining her grandparents’ lake house, her favorite jam shorts, emblazoned with bright-colored flowers, a collection of vintage decorative boxes. Her work is influenced by the many places she's lived and traveled around the world, from her woodsy New England roots to the Mediterranean, the streets of Oaxaca to the Marrakesh Medina, as well as her beloved Atlantic Ocean. When she’s not out looking for inspiration, you can find Kate in her studio in Salem, MA, working alongside fellow artists and adventurers. She loves to explore new mediums, but her current favorites are pen and paint, collage, block-printing and ceramics. Kate is always looking for opportunities to collaborate, whether through art licensing or purchases, commissioned pieces or custom illustration. 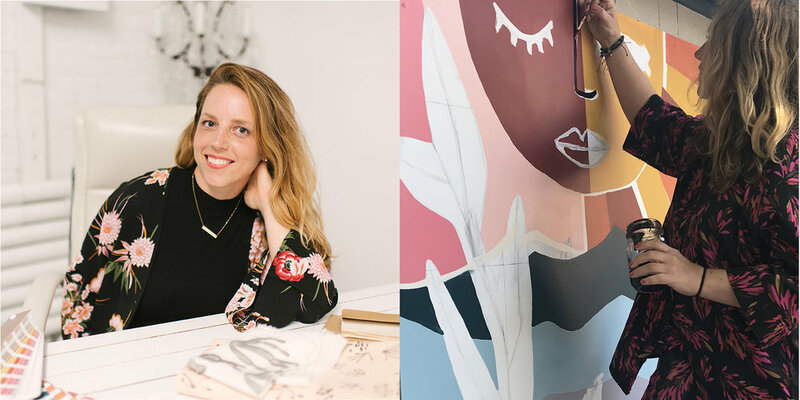 She has also recently expanded into the world of public art, creating exterior wall murals in her city and even painted a public piano covered in pattern! Some previous clients include Nickelodeon, the NFL, Keds, Obama for America, The World Food Program and Lord Hobo Brewing Co.